Elassandra closely integrates Elasticsearch within Apache Cassandra as a secondary index, allowing near-realtime search with all existing Elasticsearch APIs, plugins and tools like Kibana. Elasticsearch data is no longer stored in Lucene indices, but in Cassandra tables. Elasticsearch discovery now relies on the cassandra gossip protocol. When a node joins or leaves the cluster, or when a schema change occurs, each node updates the nodes status and its local routing table. Logging is now based on logback as in Cassandra. By default, Elasticsearch document fields are multivalued, so every field is backed by a list. Single valued document field can be mapped to a basic types by setting ‘cql_collection: singleton’ in our type mapping. See Elasticsearch document mapping for further details. All writes to a Cassandra node are recorded both in a memory table and in a commit log. When a memtable flush occurs, it flushes the elasticsearch secondary index on disk. When restarting after a failure, Cassandra replays commitlogs and re-indexes elasticsearch documents that were not flushed by Elasticsearch. This is the reason why elasticsearch translog is disabled in Elassandra. Unlike Elasticsearch, sharding depends on the number of nodes in the datacenter, and the number of replica is defined by your keyspace Replication Factor . Elasticsearch numberOfShards is just information about the number of nodes. When adding a new Elassandra node, the Cassandra boostrap process gets some token ranges from the existing ring and pull the corresponding data. Pulled data is automatically indexed and each node update its routing table to distribute search requests according to the ring topology. If a node becomes unavailable, the routing table is updated on all nodes to route search requests on available nodes. The current default strategy routes search requests on primary token ranges’ owner first, then to replica nodes when available. If some token ranges become unreachable, the cluster status is in red, otherwise cluster status is in yellow. The routing table now distributes search request on 2 Elassandra nodes covering 100% of the ring. Internally, each node broadcasts its local shard status to the gossip application state X1 ( “twitter”:STARTED ) and its current metadata UUID/version to the application state X2. Write operations (Elasticsearch index, update, delete and bulk operations) are converted into CQL write requests managed by the coordinator node. The Elasticsearch document _id is converted into an underlying primary key, and the corresponding row is stored on many nodes according to the Cassandra replication factor. 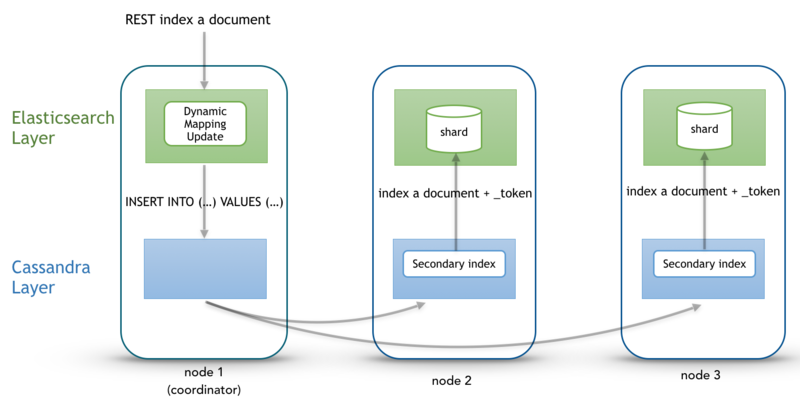 Then, on each node hosting this row, an Elasticsearch document is indexed through a Cassandra custom secondary index. Every document includes a _token fields used when for searching. At index time, every node directly generates the Lucene fields without any JSON parsing overhead, and the Lucene files do not contain any version number, because the version-based concurrency management becomes meaningless in a multi-master database like Cassandra. Search request is done in two phases. First, the query phase, the coordinator node adds a token_ranges filter to the query and broadcasts a search request to all nodes. This token_ranges filter covers the entire Cassandra ring and avoids duplicating results. Secondly, in the fetch phases, the coordinator fetches the required fields by issuing a CQL request in the underlying Cassandra table, and builds the final JSON response. Elassandra provides a random search strategy requesting the minimum of nodes to cover the whole Cassandra ring. For example, if you have a datacenter with four nodes and a replication factor of two, only two nodes will be requested with simplified token_ranges filters (adjacent token ranges are automatically merged). Additionally, as these token_ranges filters only change when the datacenter topology changes (for example when a node is down or when adding a new node), Elassandra introduces a token_range bitset cache for each lucene segment. With this cache, out of range documents are seen as deleted documents at the lucene segment layer for subsequent queries using the same token_range filter. It drastically improves the search performances. Elassandra has no master node to manage the Elasticsearch mapping and all nodes can update the Elasticsearch mapping. In order to manage concurrent simultaneous mapping and CQL schema changes, Elassandra plays a PAXOS transaction to update the current Elasticsearch metadata version in the Cassandra table elastic_admin.metadata. Once the PAXOS transaction succeed, Elassandra coordinator node applies n batched-atomic (1) CQL schema update boadcasted to all nodes, update and broadcast its gossip fields X2 with its host_id/version_number. Version number increase by one on each mapping update. Then, non-coordinator nodes catch the CQL schema change, reload their mapping and annonce the same X2 once the new Elasticsearch mapping is applied. As the result, all nodes sharing the same Elasticsearch mapping should have the same X2 value and you can check this with nodetool gossipinfo, as show here with X2 = e5df0651-8608-4590-92e1-4e523e4582b9/1. (1) All CQL changes invloved by the Elasticsearch mapping update (CQL types and tables create/update) and the new Elasticsearch cluster state are applied in a SINGLE CQL schema update. The Elasticsearch metadata are stored in a binary format in the CQL schema as table extensions, stored in system_schema.tables, column extensions of type frozen<map<text, blob>>. When snapshoting a keyspace or a table (ex: nodetool snapshot keyspace), Cassandra also backups the CQL schema (in <snapshot_dir>/schema.cql) including the elasticsearch index metadata and mapping, and thus, restoring the CQL schema for an indexed table also restore the associated elasticsearch index definition in the current cluster state.